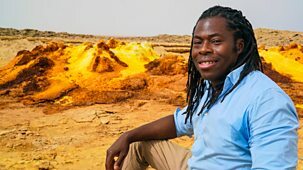 The second leg of Ade Adepitan’s four-part journey around Africa, a continent undergoing huge change. This leg takes him across central Africa, from the coast of Gabon, through the giant Democratic Republic of Congo, and on to Uganda. \n\nHe starts off the coast of Gabon looking for humpback whales. It is one of Africa’s best spots for seeing them, thanks to Gabon’s vast marine sanctuaries. The country is an eco-paradise, not just in the water, but on land as well where 80% of it is forested. But the country has recently introduced one of the most destructive agri-businesses in the tropics - palm oil farming. Ade discovers how Gabon hopes to do it sustainably. The country has impressive environmental credentials, but on a tour of its divided capital Ade hears that some people are skeptical. One critic suggests it is a way for the country’s autocratic ruler Ali Bongo Ondimba to curry favour with the international community. \n\nNext up is perhaps the most chaotic and corrupt country in Africa, the Democratic Republic of Congo. Ade discovers first-hand how everyone from the traffic police to the country’s top politicians are on the take. 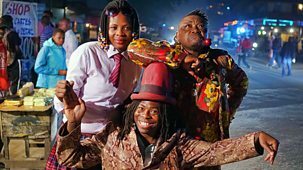 He also spends time with some of Kinshasa’s musicians and ‘sapeurs’ – people who get kitted out in the finest haute couture in one of the poorest countries on the planet. \n\nIn DRC’s far east, he finds out what lies at the heart of the country’s problems: a never-ending conflict amongst local militia, fuelled by foreign countries who want to get their hands on the DRC’s vast resources. After going on a tank patrol with the UN, he meets Kibomango, a champion boxer who is helping to rehabilitate some of the country’s 30,000 child soldiers. 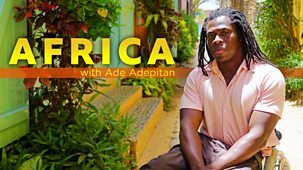 \n\nTravelling into one of the most famous national parks in the world, Virunga, Ade discovers that few areas of the country have been left unscarred by the violence. And the impact on the wildlife has been extreme, as Ade encounters some of the world’s few remaining mountain gorillas. \n\nHis final stop on this trip is Uganda where he meets Bobi Wine, one of Africa’s most outspoken political campaigners. Bobi was recently arrested and beaten, and his driver killed, after his protests drew the attention of long-standing dictator Yoweri Museveni. 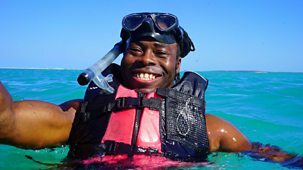 Ade meets a defiant man who will not give up, no matter what threats are made on his life. He is part of a new generation of Africans who are fighting to take back control from the post-colonial leaders who have done so much to wreck the continent.